Have you ever noticed that we tend to have the same kind of weather for a few days at a time. For example, cool rainy days or warm sunny days seem to come in bunches. This is because the weather that we experience is brought to us in massive sections of the troposphere called air masses. AIR MASSES ARE GIAGANTIC CHUNKS OF THE TROPOSPHERE THAT HAVE UNIFORM WEATHER CONDITIONS. THIS MEANS THE TEMPERATURE AND HUMIDITY ARE CONSTANT THROUGHOUT THE WHOLE AIRMASS. At any given time several air masses will cover the continental United States, bringing different kinds of weather to the different areas they cover. There are several types of air masses, each with distinct combinations of temperature and humidity. The kind of temperature and humidity an air mass has depends on where it forms. Because their source region is so important, AIR MASSES ARE NAMED AFTER WHERE THEY FORM. Winds push these air masses around the Earth. As they travel they bring their characteristic weather with them. For example if a mT air mass moves in over NYC it will bring with it warm humid air, so things will get hot and gross. Likewise, if a cP air mass moves in things will become cold and dry.Because they are so large an air mass usually covers an area for 2-3 days as it slowly moves away. As air masses move they begin to change. This makes sense because if a cP air mass moves South away from the source of its cold dry air, it will gradually warm up. 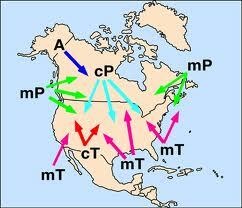 The slower the air mass moves the more time it has to change, so faster moving air masses change the least.